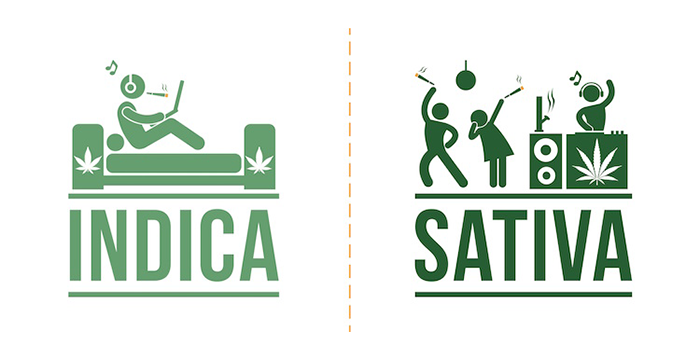 Sativa vs Indica: You're being lied to! How Marijuana Can Help Sativa vs Indica: You're being lied to! Sativa vs Indica: You’re being lied to! The names indica and sativa should only refer to the leaves of the plant. Indica leaves are fat and stalky, whereas, sativa leaves are long and skinny. Other than that, it is a complete misconception that one will put you to sleep while the other is more creative. The truth is we have all been using a placebo effect instead of researching a better way to classify these strains. Strains, themselves, vary from grower to grower based on physical and environmental conditions. Therefore the levels of THC, CBD, and the terpene analysis of the exact same strain can be so different! We have always relied on medical marijuana professionals for answers, but as time suggests, we should severely reconsider our misinterpretation of medical marijuana. The medical marijuana industry is not regulated, therefore medical marijuana professionals do not legally have to lab-test any of the cannabis that they sell to you as medicine. Dr. Jeffrey Raber suggest a better classification system, based on these lab tests, would be a necessary step towards a more cohesive understanding of the psychological effects cannabis has on the user. The classification system would include a more extensive analysis of terpenes, which are really what we need to know about. Terpenes are “the enormous range of scents and flavors found in marijuana.” Terpenes will help us determine the psychological effects based on a “terpenoid profile” of marijuana better than just a popular name. This will also help us decide what works best with our own genetic makeup. Some dispensaries lab-test all of their products, whereas others do no not. Lab testing is a form of transparency therefore you will want to start looking into collectives that have this information readily available to you. We all have a unique chemistry as humans therefore we do not feel the same effects from the prescribed ideas that are held for sativa and indica. It is impossible to duplicate the experiences we have with marijuana, without recognizing, first, the best research is done by yourself. That is why it is so important that your products are lab-tested, so you can medicate yourself based on the terpene analysis and THC or CBD content, rather than the next trending strain name. The truth is, very little medical marijuana research has actually been done. It is no longer beneficial to take someone’s word for it.